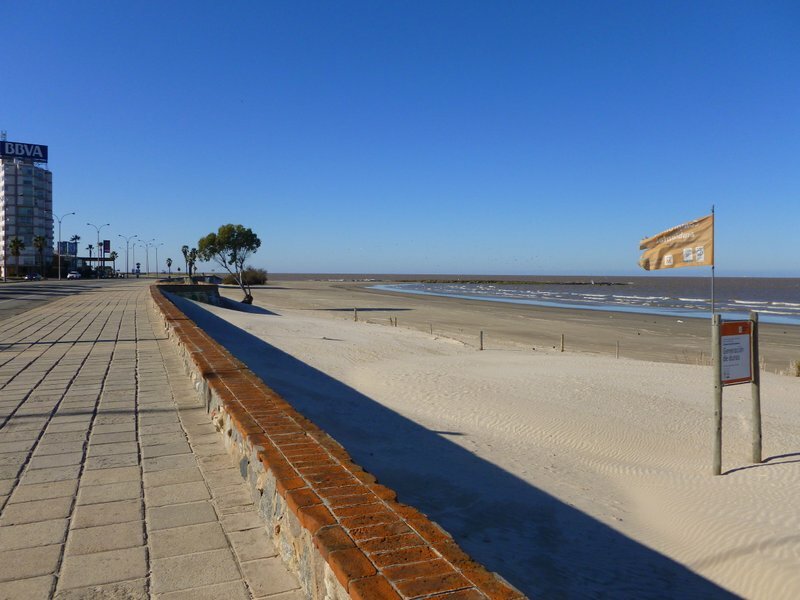 Grapamiel is a traditional Uruguayan liquor made from a mix of grappa and honey. Grappa is distilled from the solid grape residue after it is pressed for making wine. As Grappa is an Italian brandy, it is to figure out how it made it’s way to Uruguay with the huge Italian influence in the country. 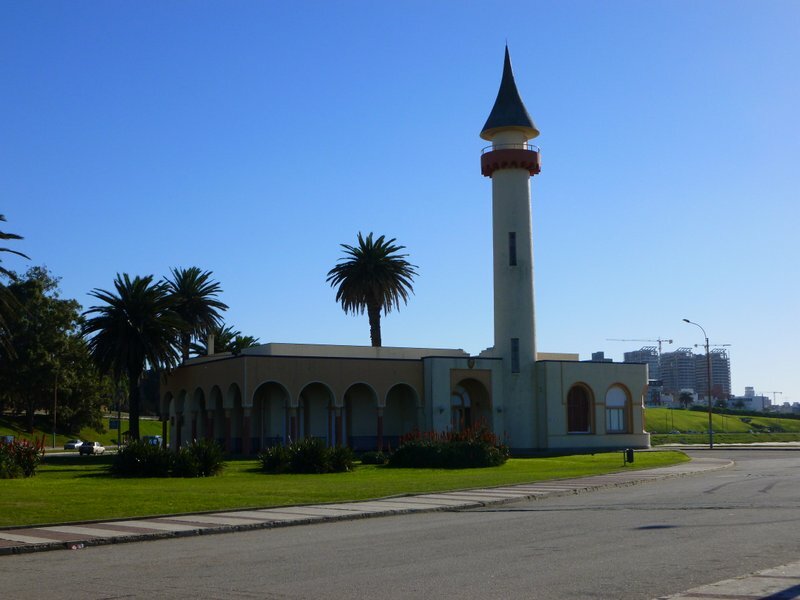 It is the national drink of Uruguay, although it is severely outnumbered by bottles of whiskey in all the stores. As you can imagine, it is a fairly sweet liquor with about 25% alcohol. It is not readily available in the states except maybe some speciality liquor stores. Some websites say all one has to do is to mix grappa and honey and it will taste the same. We haven’t tried. 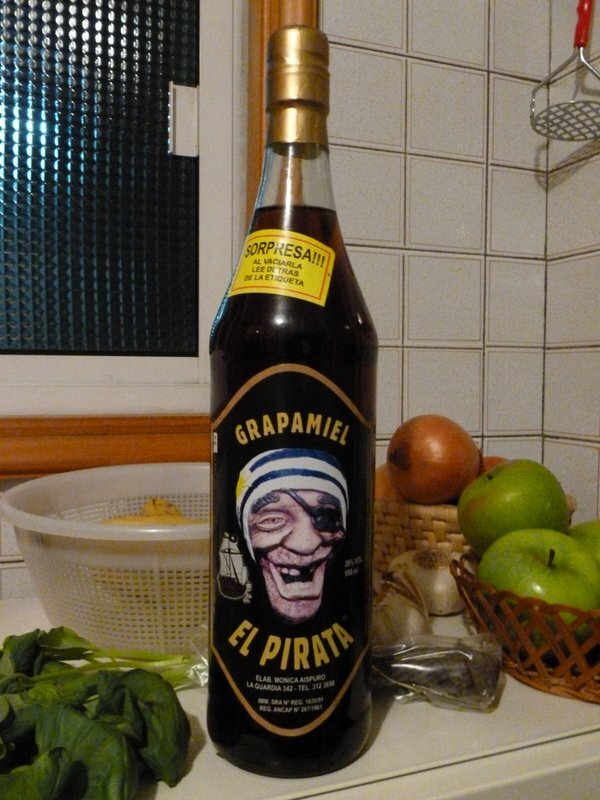 Our favorite brand of grapamiel, El Pirata! There are a lot of brands of grapamiel. Some are more sweet and others have more grape flavor. Either way, grapamiel is super cheap. The above bottle of Pirata (about 1L) costs $7 US. We think it’s a great after dinner sipper and it should definitely be on everyone’s list to try if given the opportunity (e.g. 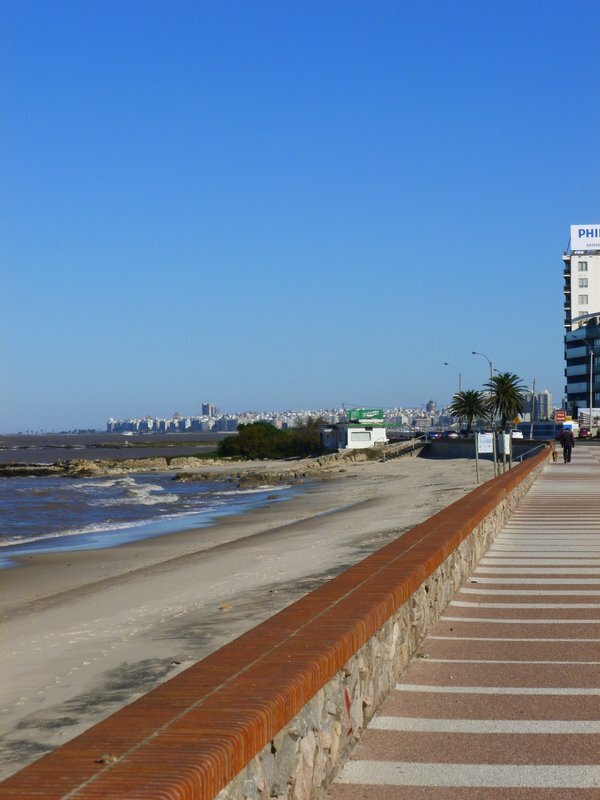 if you find yourself in Uruguay or we bring some back for you)! You may think that riding public transportation is boring. 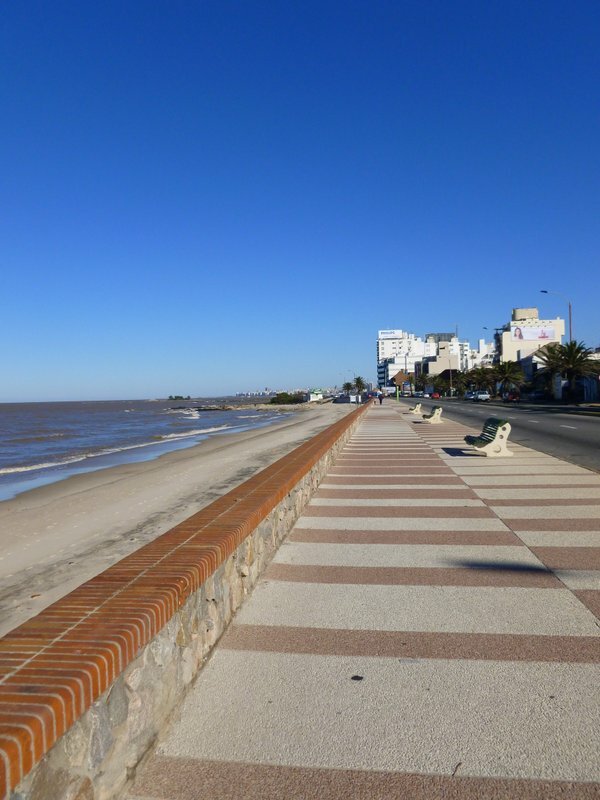 Well, not in Montevideo or Buenos Aires. 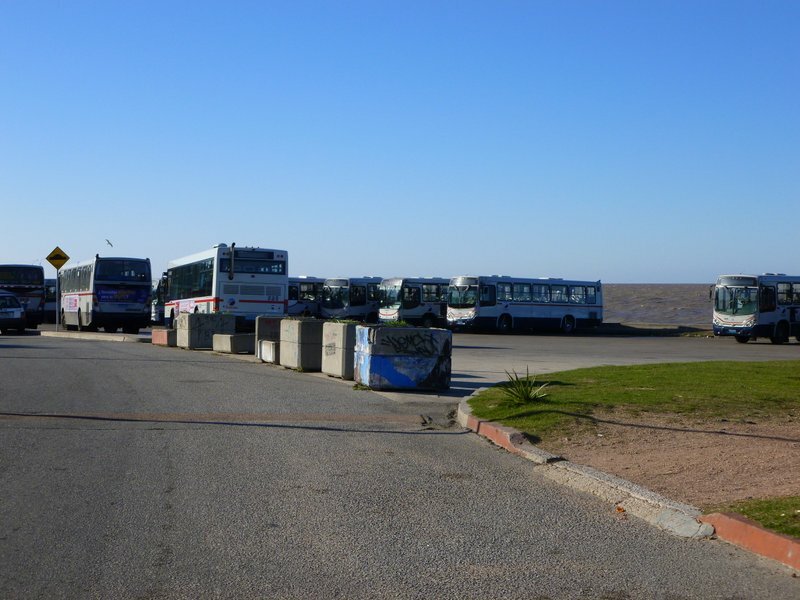 Here in Montevideo, people are allowed on the bus, free of charge, if they are trying to raise money for a cause, trying to sell something, or offer some kind of entertainment. The most common causes for trying to raise money seem to be religious, but every so often a group holds a fundraising event throughout the entire city. For example, a couple weekends ago, a group very similar to Habitat for Humanity did a fundraising event. They had hundreds of people out in the city, on street corners, on the buses, and in the squares asking for donations. People also try to sell just about everything on buses. We have seen people selling socks, pens and pencils, and stickers. I have even seen someone get on a bus selling candy. He had a piece of cardboard about 3x3ft that had every kind of candy imaginable attached to it. It took him almost 5 min to list out all the different types he had. A common technique of people selling things on buses is to walk down the aisle placing their wares in the laps of the passengers, then pick them up on the way back to the front of the bus hoping that someone wants to buy something. Sometimes this can be a little disconcerting, but from our experience, completely harmless. The best entertainment on the bus is when someone gets on that actually wants to entertain the crowd. This will include musicians, magicians, and comedians. 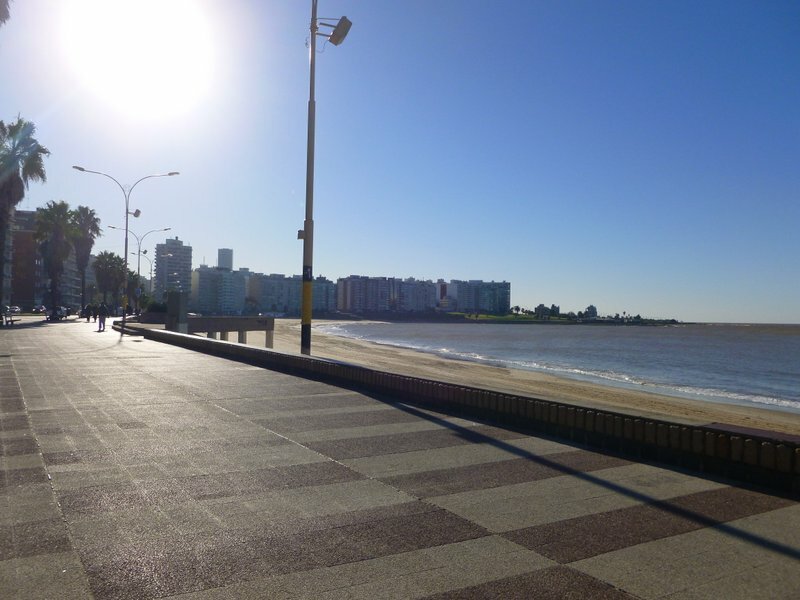 The people of Montevideo seem to reward the hard work of these entertainers and rarely do they leave the buses empty-handed. Some of these entertainers are very talented and they make the bus ride much better than if they were not present. The best show that we have seen occurred on the Buenos Aires subway. A magician got in and proceeded to do a variety of magic tricks with scarves, cards, and making things disappear and reappear. It was a very well done magic show and lasted for almost 15 minutes. He definitely deserved the bundle of change that he was rewarded with. 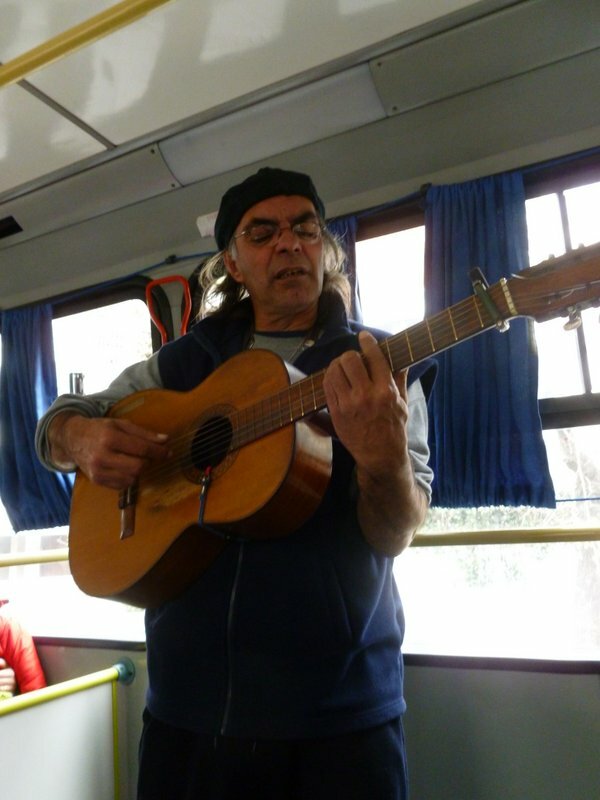 Every couple of weeks we encounter people playing the guitar and singing on the bus. Some are better than others, but none of them (so far) have really sucked. Matt was rewarded with probably the best singer/guitar player that we’ve heard on the bus on the last day he was here. 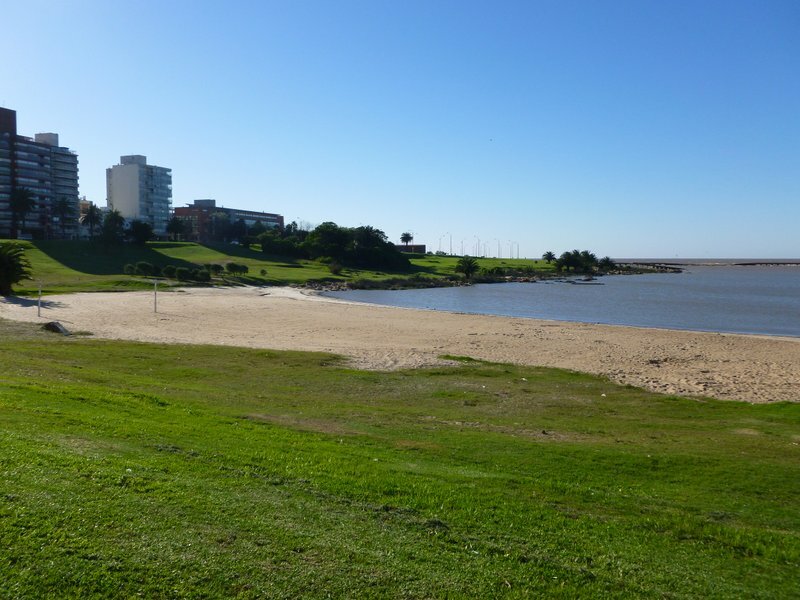 I arrive at a function here in Uruguay. It could be any function: game night, frisbee practice, a party, a spanish lesson. 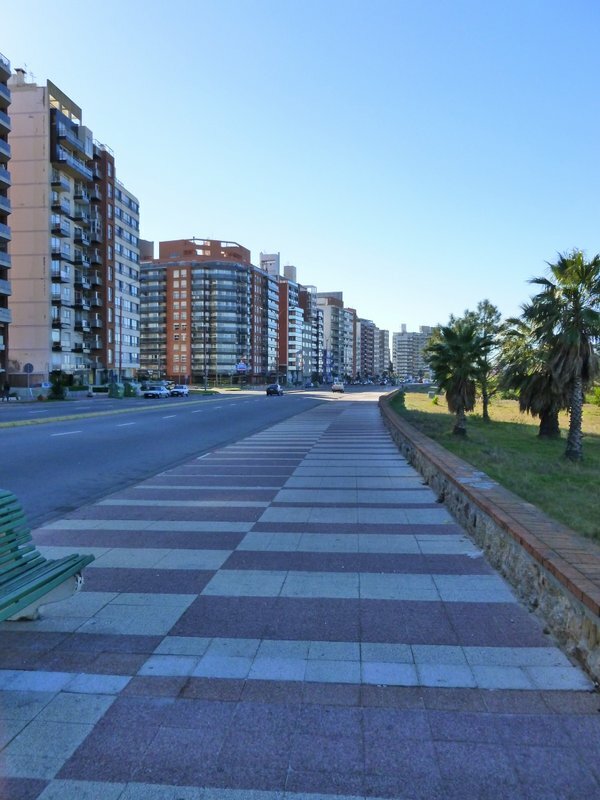 The typical Uruguayan greeting involves a kiss on the right cheek. Sometimes you can feign a kiss, but cheek touching is mandatory. Regardless of how many people are present, it is expected that you follow this routine with everyone present. This includes people you may not have ever met. With each person you must also politely ask them how they are doing and respond quickly before moving on to the next person. People will usually get up from their seated position to accept your greeting (unless they are occupied doing something on a table like playing a board game). I haven’t perceived any special hierarchy as to the order of greetings. It seems like a proximity thing; whoever’s cheek you happen to be nearest gets the first kiss. If you do not know the person whom you are addressing, it is custom to say your name after your greeting in lieu of asking them how they are doing. That person will usually also say their name. As you may be thinking, sometimes this results in both people saying their names at the same time and neither one will actually get the other’s name correct. It’s just the nature of the beast. Sometimes a gentlemanly handshake is accepted as a greeting or farewell between men, but never between ladies or between a man and a lady. Farewells usually consist of the same process as greetings. Sometimes when trying to leave a large group of people that you don’t know very well, it is acceptable to kiss those you do know well and give a hearty wave and “chau” to those you don’t. Otherwise a kiss for each person is required along with “nos vemos” (literally translated as we see each other). 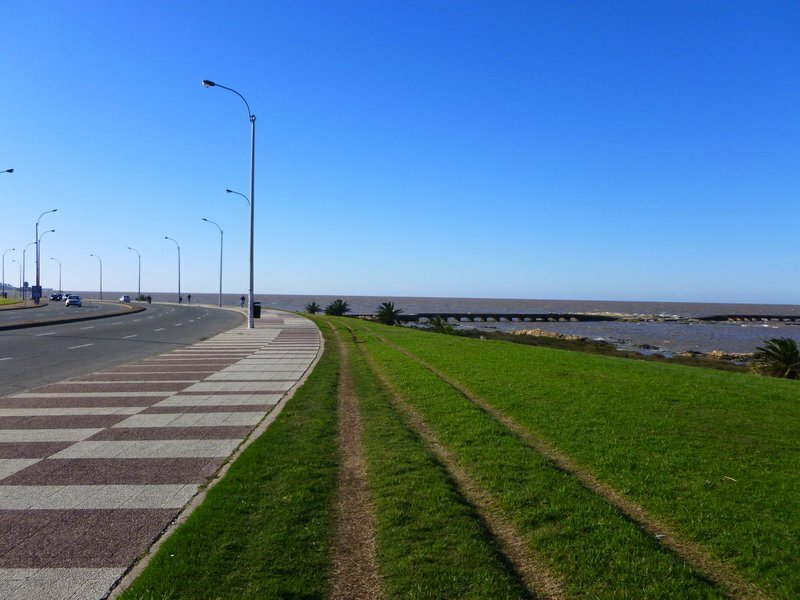 For someone, like me, that wasn’t well practiced in the Uruguayan art of greeting, the act of saying hello and goodbye to people has resulted in some fairly humorous and painful moments. I have frequently and accidentally jabbed people in the head or eye with my baseball hat, I have stepped on toes, tripped on things trying to get close enough for a kiss with an acquaintance which resulted in my falling onto said acquaintance, and knocking heads on accident. All of these incidents were met with laughter. I mean really, you can’t be mad at the silly “gringo” for too long. As you can imagine, the process of greeting and saying farewell can be long and tedious (and potentially dangerous) depending on the size of your party. On the other hand, it provides a personal connection with each person to whom you are interacting. There is an opportunity to address each person as an individual and show them with a small gesture that you value their company. I know that when I am greeted by my friends here I feel like they care about me and genuinely want to interact with me. I feel included regardless of what I am doing. Just imagine if people in the US greeted each other with a kiss. One of the perks about the farmer’s market near our house, other than being super close, is that there is the added benefit of lunch. There is a pair of people that set up shop on the corner each week to sell fresh empanadas and torta fritas. What makes this even better is that they are fried to perfection. We can’t figure out if the empanadas are made by them or picked up at a store prior to their farmer’s market appearance. 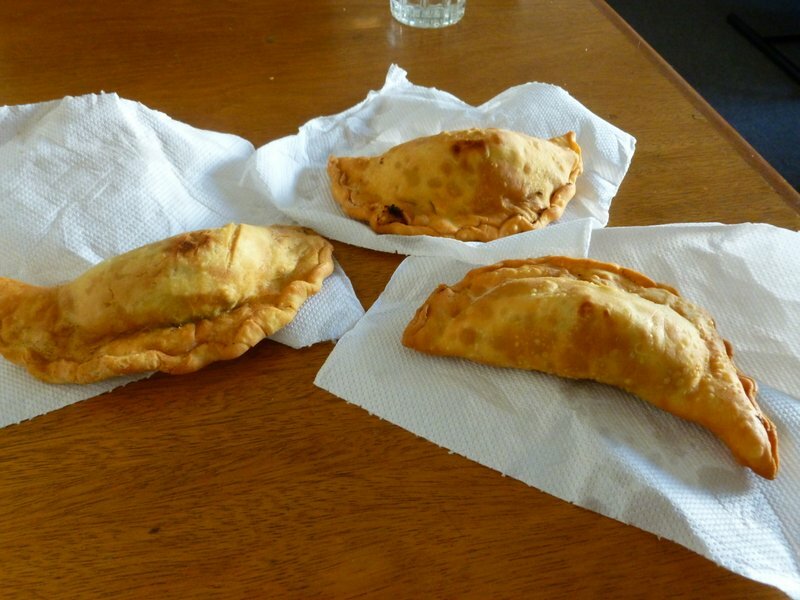 Regardless, they usually have “carne” (beef with some hard boiled egg – yeah they put hard boiled eggs in a lot of things, especially empanadas) and “jamon y queso” (ham and cheese) empanadas. 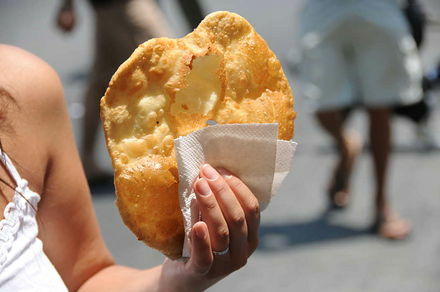 Torta fritas are basically discs of fried bread with a hole in the middle. 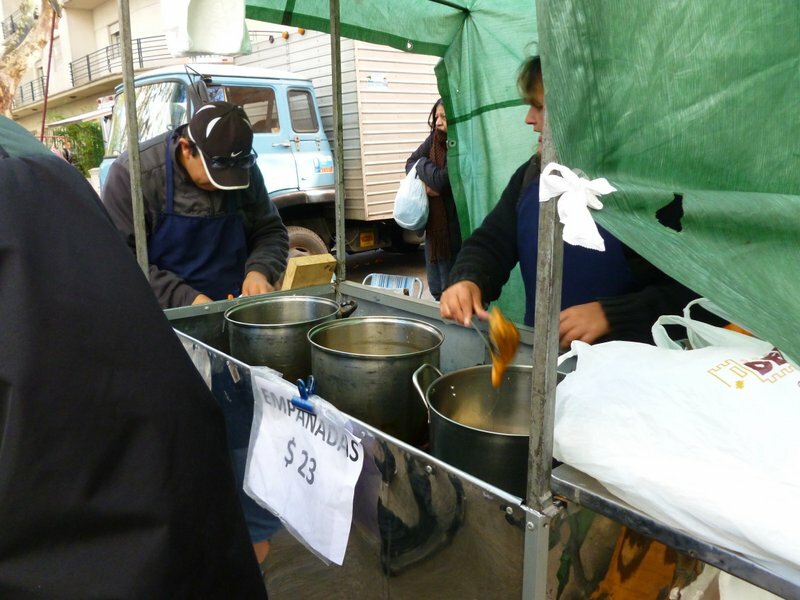 It is a traditional Uruguayan food to eat when the weather is nasty or rainy. If people don’t want to make them at home, there are plenty of these little stands that get set up to sell them. Usually there are at least one at most farmer’s markets. At our little farmer’s market, this pair does great business. Regardless of the time we arrive to claim our snacks, there is always a line. It’s definitely worth the short wait! One of the other great things about empanadas and torta fritas: the price. A single torta frita sells for 13 pesos (about 50 cents US) and an empanada costs a mere 23 pesos (about a dollar US). I can easily get a lunch for a buck fifty US! 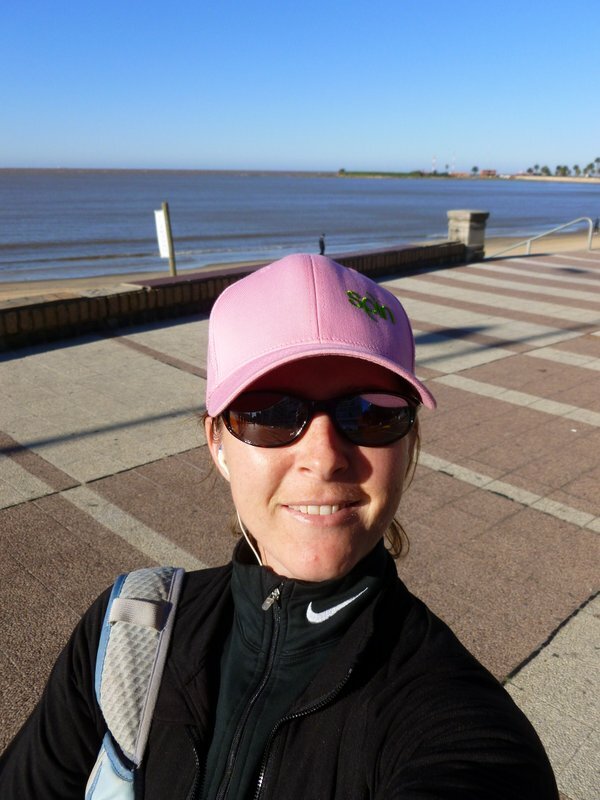 On Friday’s long run I decided to take photos to document my adventure and show you guys where I run every day. It was a bit chilly with a temp of about 48 to start with and the wind was blowing about 15-20 mph. 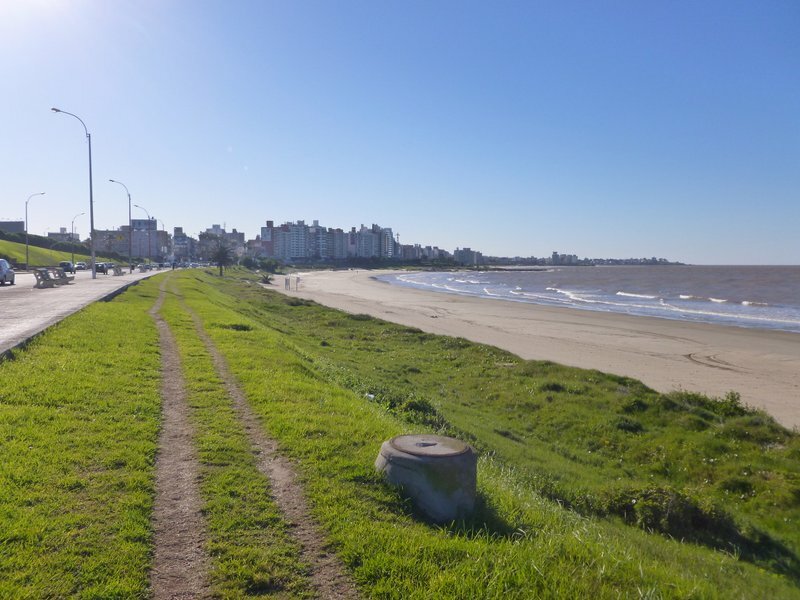 I decided to head towards the airport and away from the city on my long run. 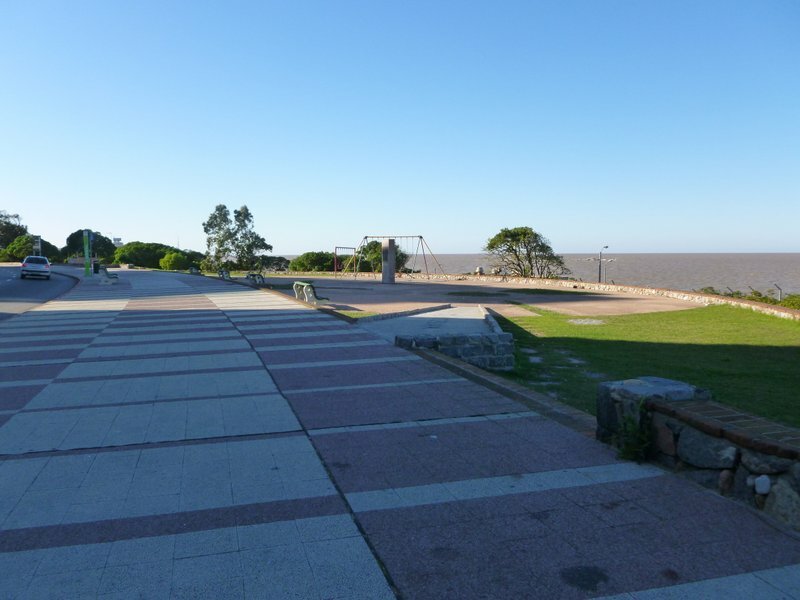 At the point is the end of Pocitos and there is a little park there. 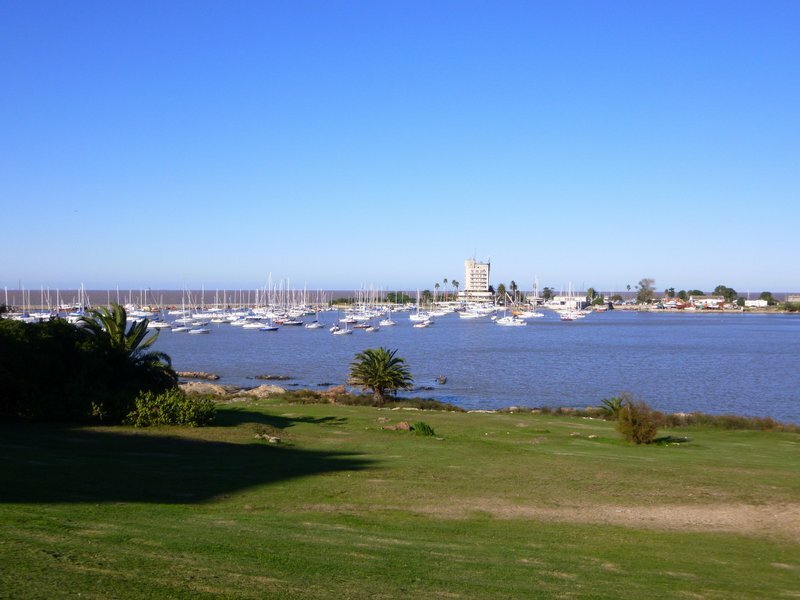 This is the Buceo yacht club and marina. 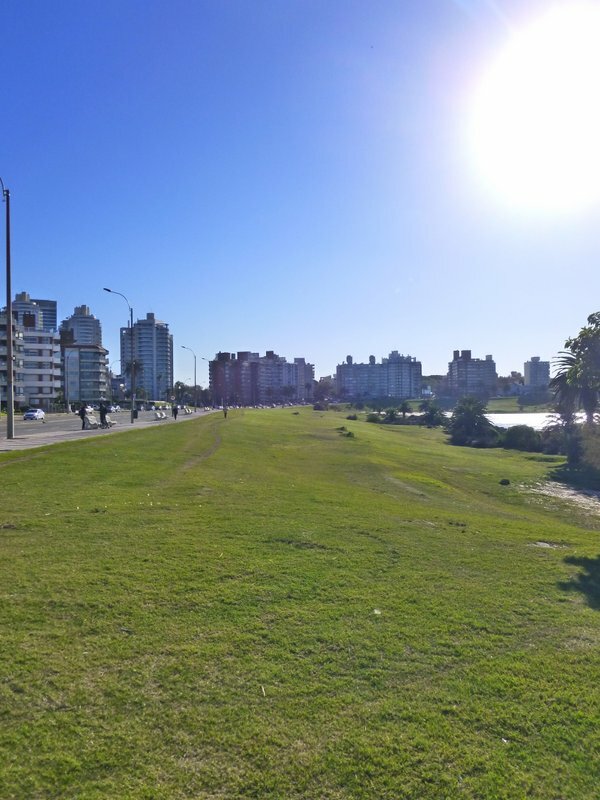 There is a nice grassy area to run on instead of the pavement. In the distance you can almost see one of the only “hills” on the route. Yet another deserted little beach (gotta remember that it’s probably about 50 degrees and a little cold for beach going). 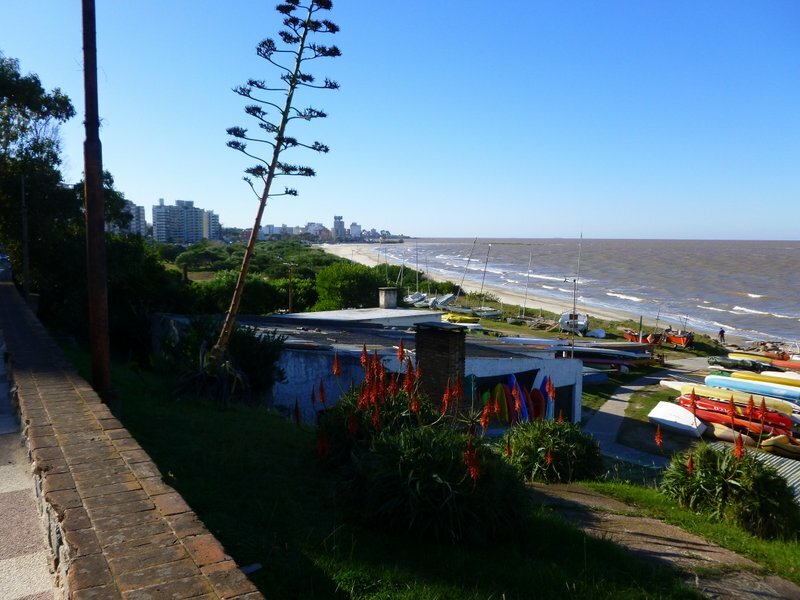 View of the Buceo marina from the top of the “hill”. Looking the other way down the “hill”. I can’t decide whether these paths are made solely by people or also by mowers. 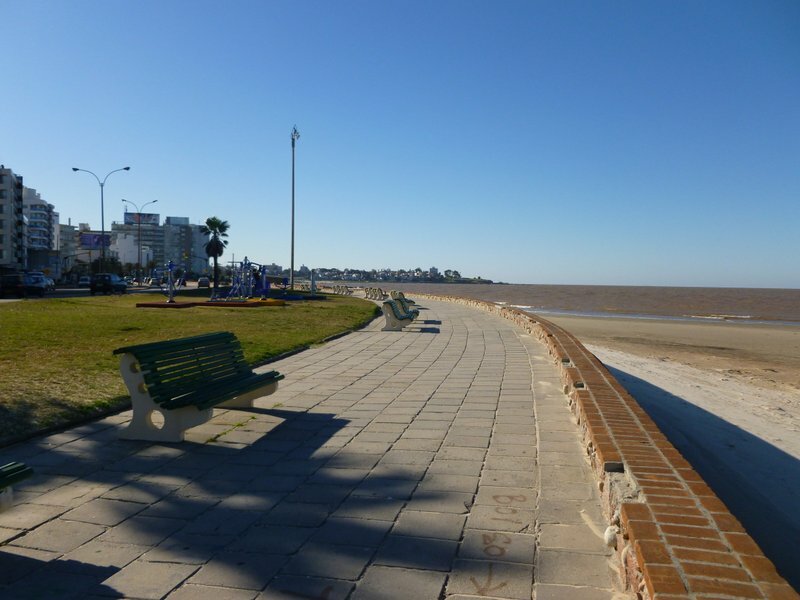 Around the corner from the museum is yet another beach (Buceo Beach) and more paths to run on. Top of the second “hill” on the route and there’s a little playground. 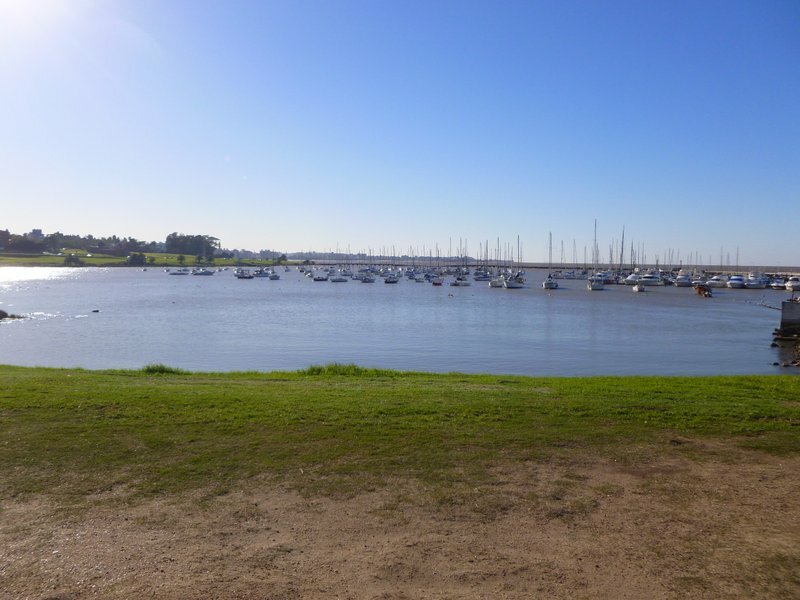 This is the “Nautical Club”, another small yacht club. 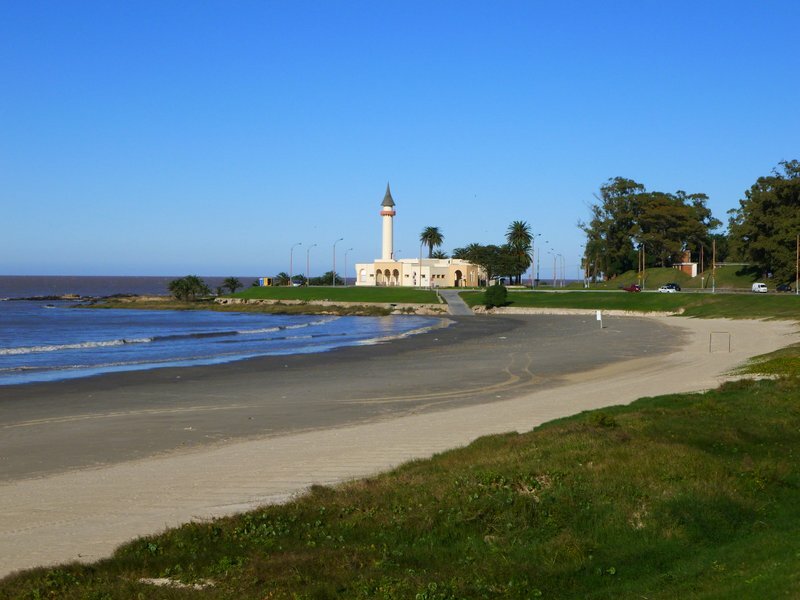 Malvin beach. We played ultimate out at that point once. Yep, still windy! 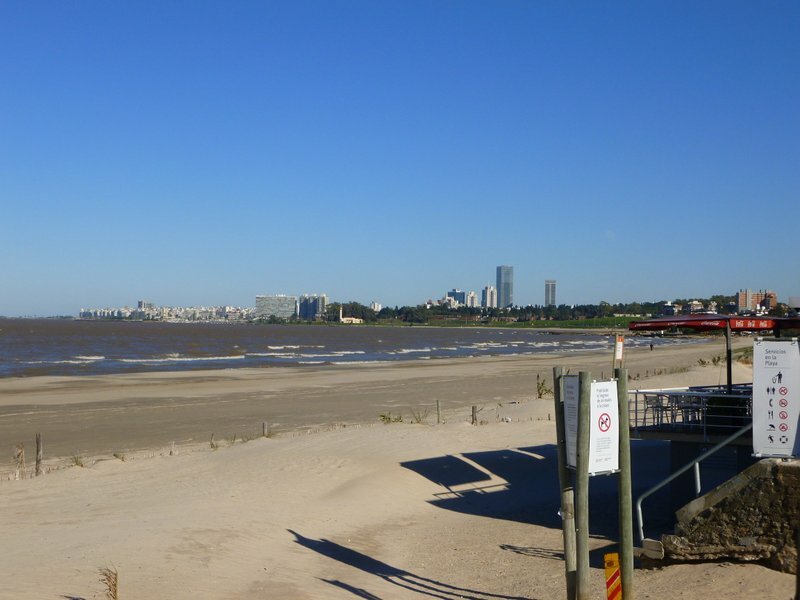 This is the view from Malvin Beach looking back at Pocitos. Just to the left of the museum is a wide building. To the left of that is Pocitos, or I should say, home. 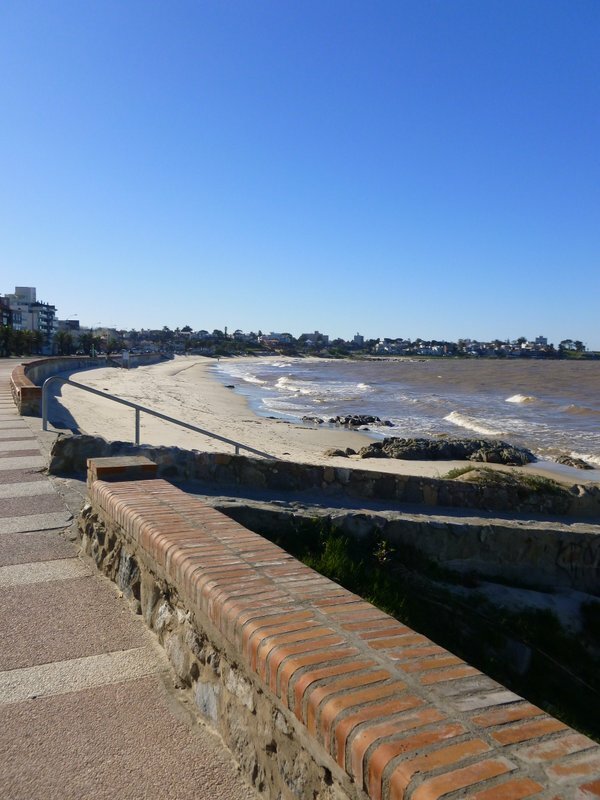 The point at Malvin beach. There is some exercise equipment here that anyone strolling along the Ramblas can use. Yet another beach awaited me as I rounded the corner. 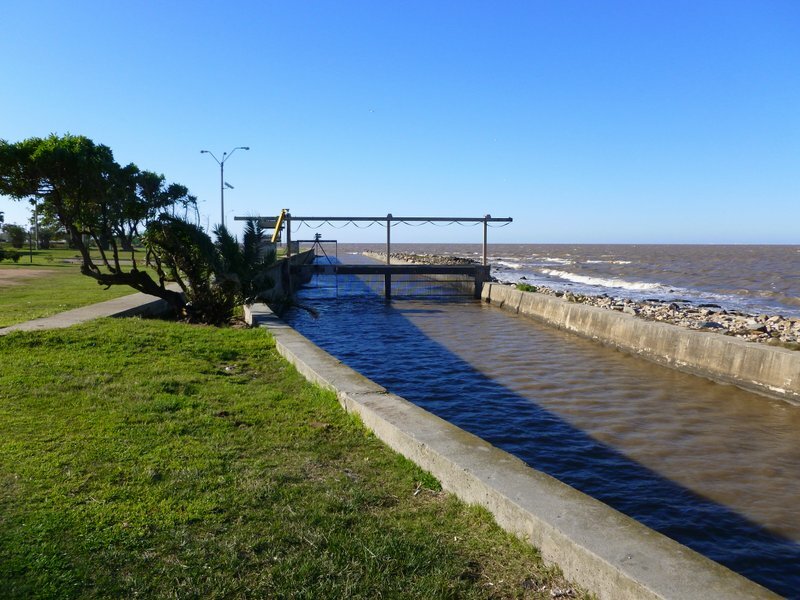 Honda Beach. This is zoomed in a little so that you can see the buildings in the background. That’s home. So far from home. I passed all the same landmarks on the way home. The only difference, I had the wind in my face. Yuck! 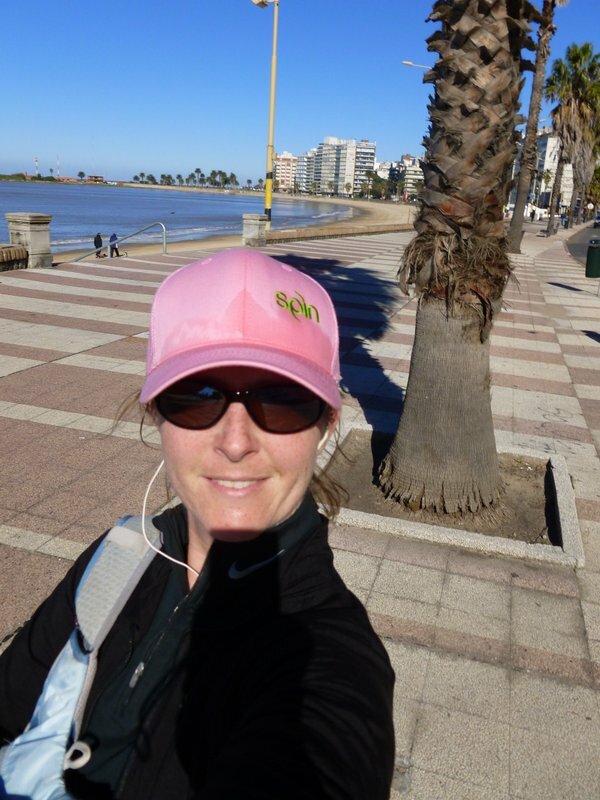 Yep, I made it back home and really the only evidence I have are the sweat stains on my very pink hat! Here’s the google maps version of my run if you’re interested! Some of you may be wondering about basic services in the city here. Well, the only one that we’ve found remarkably different is the trash service. Individual households are not given trash bins, nor do apartment buildings have their own trash service. Instead there are large green dumpsters on the corner of every street. These dumpsters are covered and have a step pedal so that you don’t have to get dirty throwing your trash away. City trash men come around during the night and empty the big dumpsters into their garbage truck. 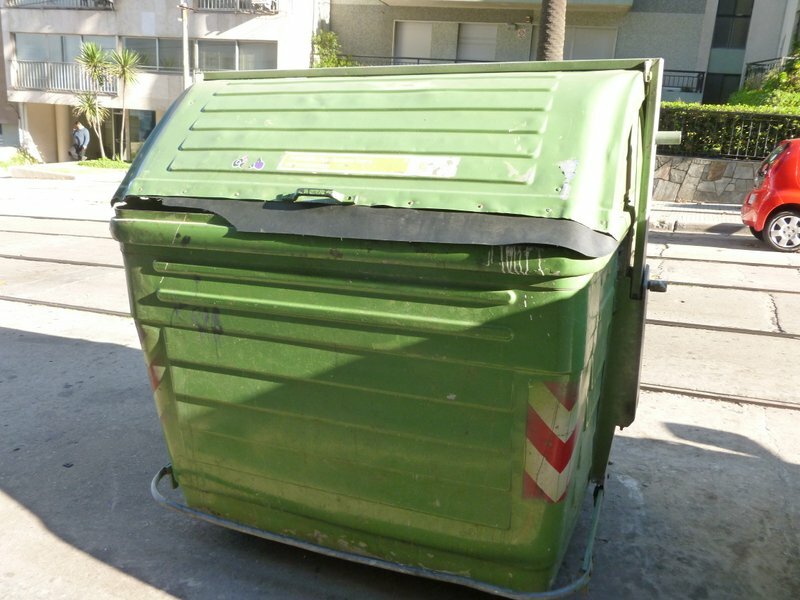 For those that don’t know, Buenos Aires trash service is similar except without the dumpsters. People throw all their trash (in bags) on the sidewalk on trash night and the garbage men come along to collect it. Makes walking around the city unpleasant on some nights and also makes for dirty streets. Another interesting aspect of the trash service around here is that there are numerous people and families that make a living off of dumpster diving. 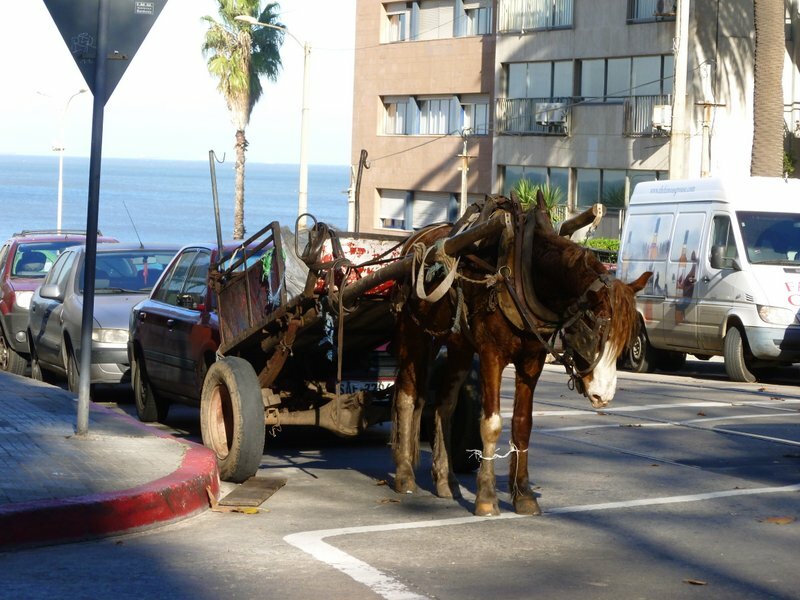 They drive around horse-pulled carts in which they store their spoils. They collect anything of value out of the dumpsters including: clothes, plastic or glass bottles (see below), food, cardboard, or really anything that could be re-sold. Sometimes dumpster diving literally involves someone getting into the dumpster and propping open the lid, while other times it just means peering in and grabbing whatever is visible. On a normal walk through the streets, even a short trip, you can seen these horse-drawn carts. The cars are polite and keep their distance. The horses all wear side blinders so that they don’t get startled by traffic. Most of the horses seem to be kept in pretty good condition, leading me to believe that people can actually make a decent living dumpster diving. Many of these horse-drawn teams likely live a bit out of the city center where there is more green space. 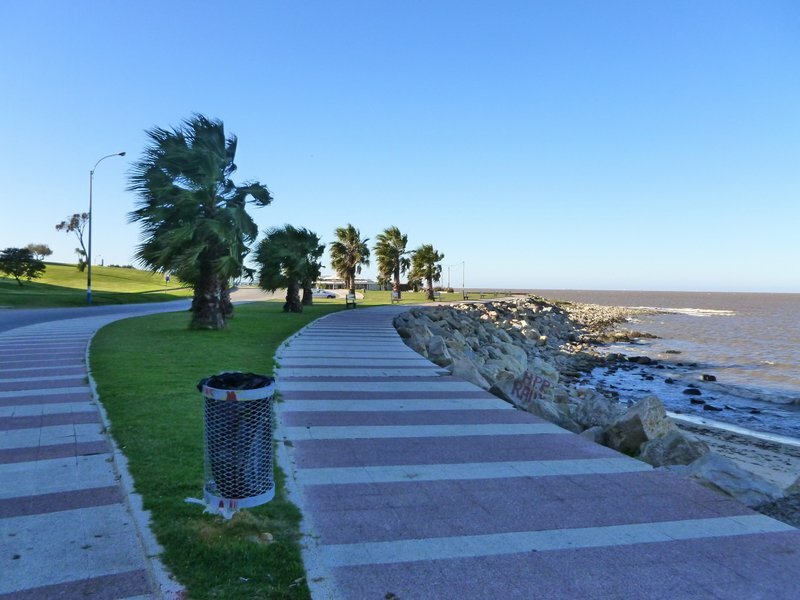 There is also no organized recycling service in Montevideo, but some plastic and glass bottles are returnable. When purchasing say a 2 liter bottle of Coke, it comes in a glass bottle and you pay a fee for the glass. The next time you go to the grocery store you can bring the empty bottle and get the fee back. There are machines in the back of large grocery stores where you can return bottles. Many of the 300 mL cokes that are purchased in restaurants are recycled in the same manner by the restaurant. It is not uncommon to purchase a coke in a restaurant and have the label be a bit worn from the process. I told you all we were going to go to another fútbol game while we were here. Thanks to Carlos (again! ), running to the nearest Abitab (more on those in another post) to buy us tickets, we were able to go. 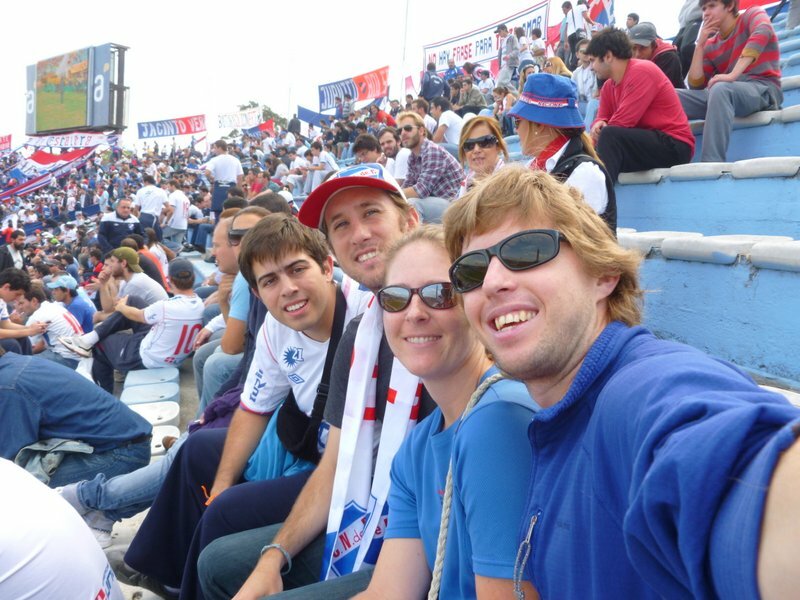 Carlos’ other brothers are Peñarol fans and he and his parents are Nacional fans, so we were more than happy to hang out with him and get to see an awesome game. Fútbol games here are a bit different than in the US. One big difference is that you literally have to choose sides. 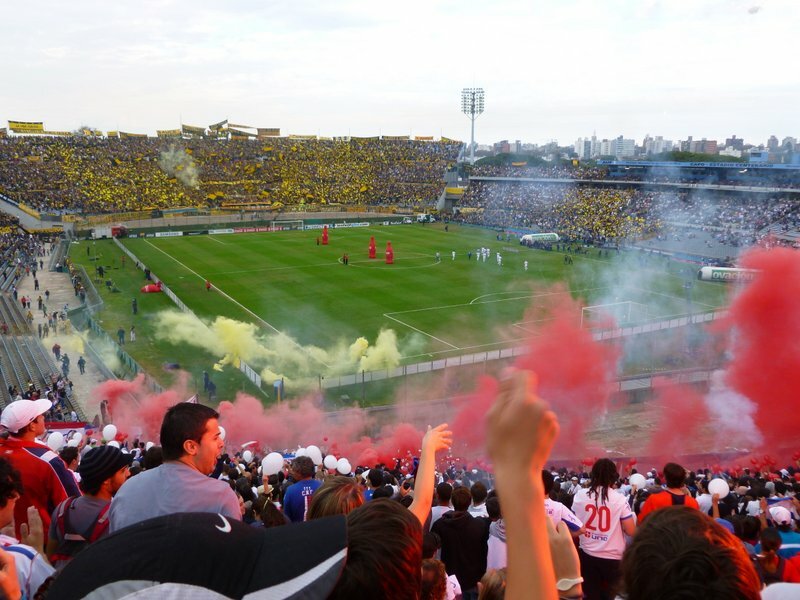 Peñarol fans were allowed to buy Peñarol tickets a week before Nacional fans. Peñarol tickets sold out in 30 minutes and were only available to those people who were part of a Peñarol club. 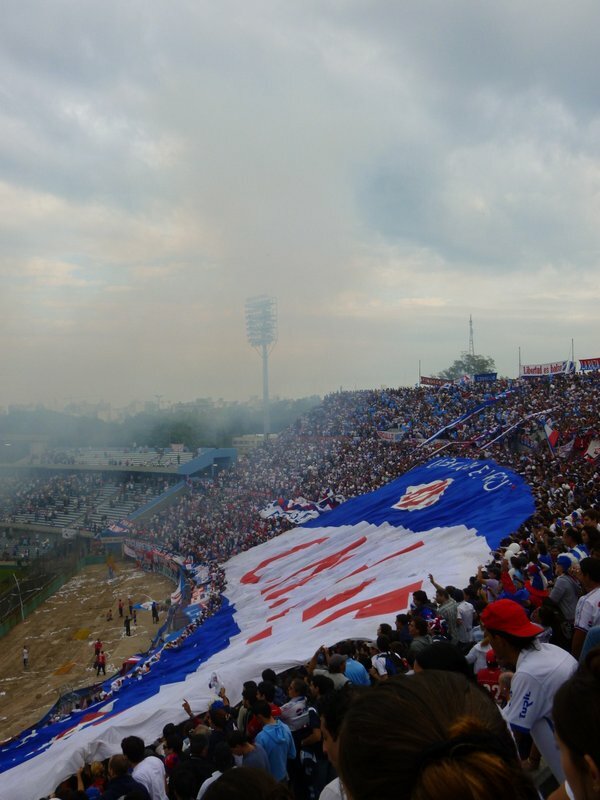 When Nacional tickets went on sale they were available to buy at local venues and also sold out fairly quickly. Not really knowing what to expect on game day, we strategically did NOT wear yellow and black (Peñarol colors). 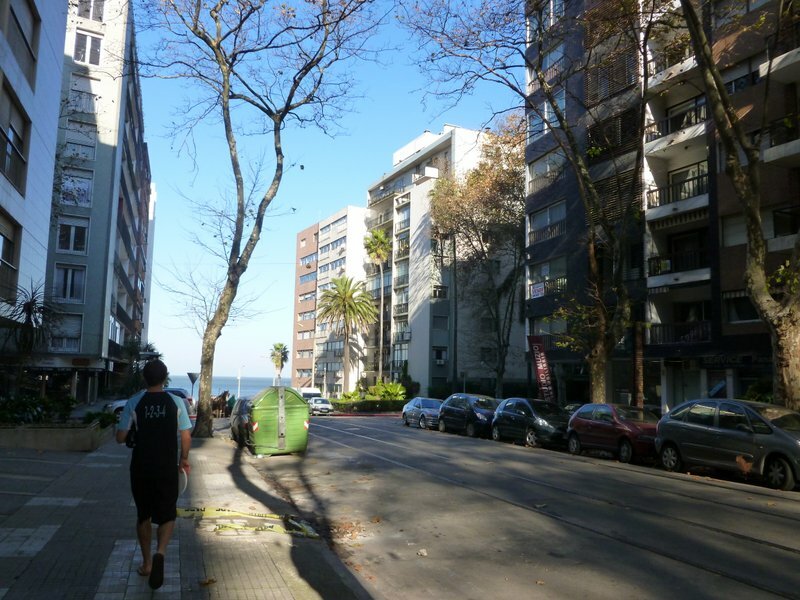 We took the bus up to Carlos’ house and on the way lost count of the number of Peñarol jerseys we saw walking along the streets. 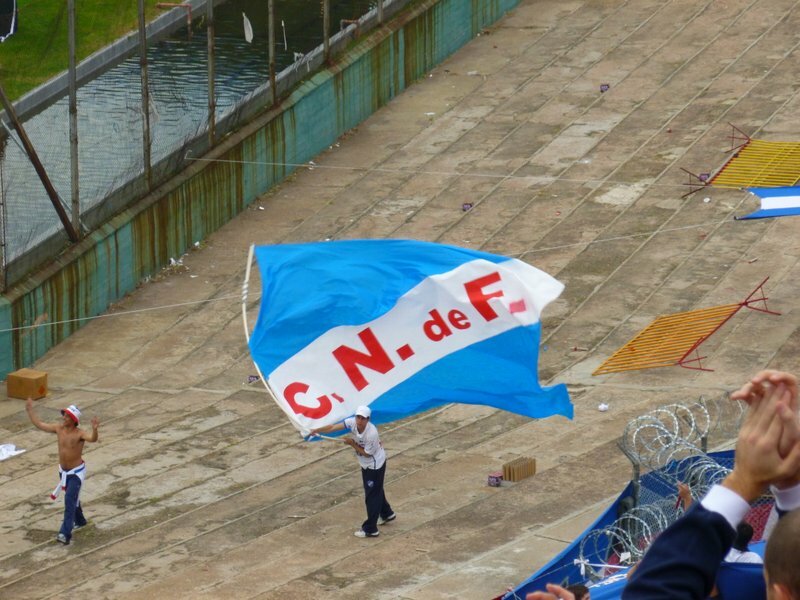 Not until we got near Carlos’ house did we see truck-loads of Nacional fans setting off fireworks in the middle of the street, decked out in their blue and white. Our experience at the stadium brings new meaning to the term “sports fan”. 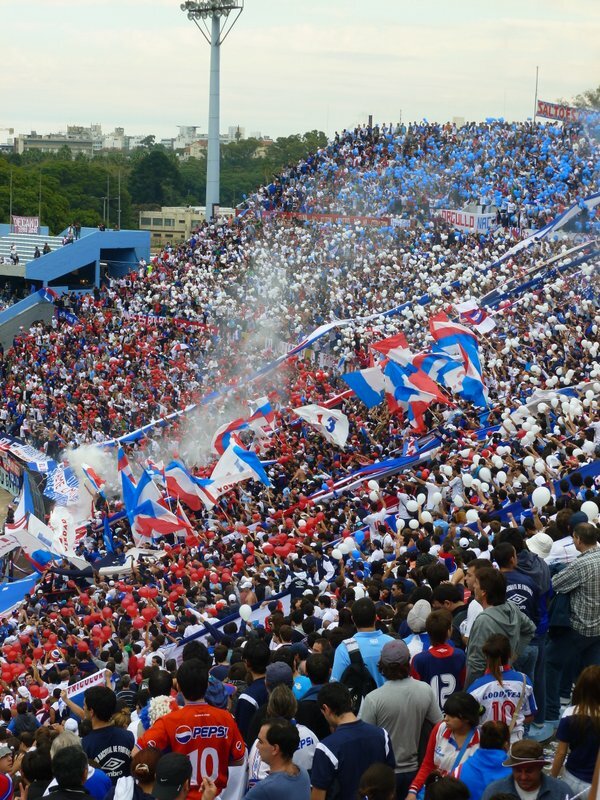 There were separate entrances for Peñarol and Nacional fans, which later made sense when we realized that the stadium was divided into sections for the two teams. Between the fans of the two teams there was an entirely empty section, presumably so that aggressive fans couldn’t hurt each other. Bags were checked at the entrance and a quick pat down was given. No bottles were allowed. There were separate lines for men and women to be checked, although the fans were composed of 10 men for every woman. Inside the stadium, one side was entirely yellow and black and the other side entirely blue and white. Fan clubs for each side hung banners from everything and anything. There were police everywhere in their swat gear, including helmets and shields (just in case). 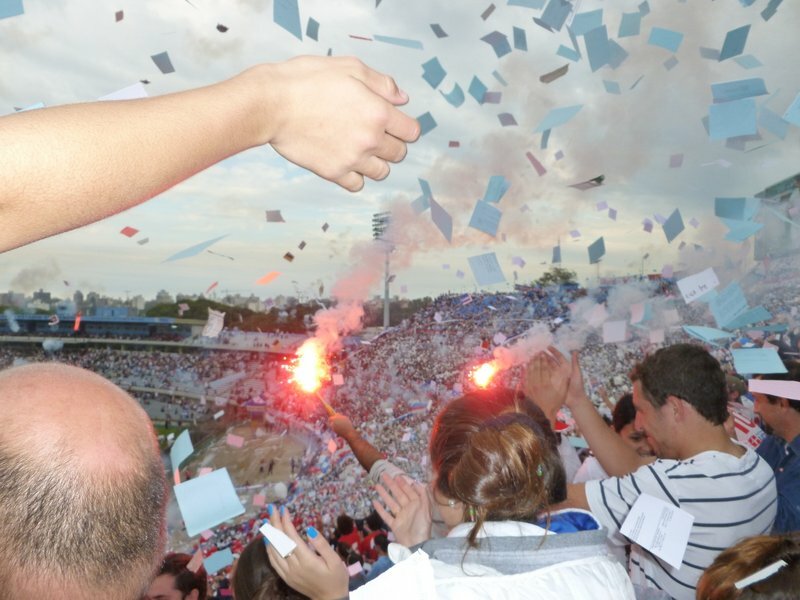 The game started with a fanfare of fireworks, colored smoke, pieces of paper, flares, and much singing. The teams have their own songs and chants. It would have been good to have learned them prior to the game, but our excitement was well shown through our screaming and cheering. The game was exciting and suspenseful, with Peñarol scoring a goal in the first minute as the result of an unseen handball, quickly followed by a penalty kick goal by Nacional. Peñarol scored a second goal with a nice kick from a wide cross which was followed by a Nacional goal that was very similar. Another Nacional goal came from an indirect kick outside the penalty box that didn’t touch a soul and we were on the winning side. Carlos won himself bragging rights for a while with his brothers! The fans around us were animated. 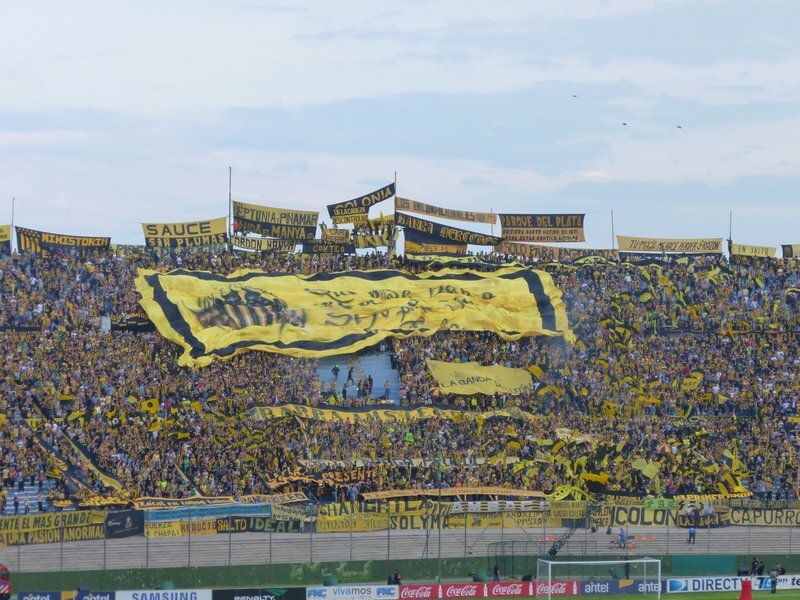 They sang songs, they taunted the Peñarol fans (even though they were far away), they stood up in their seats at every goal opportunity, they whistled instead of booing (Uruguayans are really good at whistling), and they cheered. It was an impressive display of support. On leaving the stadium we learned that our way home wasn’t going to be as direct as we had expected. Fans from each side were only allowed to exit the stadium in opposite directions. In a country with such devoted fans, I can understand the precaution. Check out some videos from the game!